Some people are messy – my office looks like it’s been ransacked by a burglar. And we messies cannot grasp how anyone can work in an office as tidy as a showroom. Why does it even matter? One of the messiest chemists, possibly of all time, was Peter Woulfe, sometimes remembered for a piece of glassware that made gas handling safer and more effective. He was born in Ireland around 1727, most likely in Teermaclane, not far from Limerick. As a young man, he moved to Spain to join a brother Esteban in Cadiz, part of the Jacobite diaspora (opposite to that of the Huguenots) that had scattered wealthy Irish Catholics across Europe after their defeat at the hands of the English. He later moved to Paris, where a relation, the banker George Woulfe, was the agent for Charles Edward Stuart – also known as Bonnie Prince Charlie. In Paris, Woulfe began attending chemistry courses by the leading chemistry lecturer of the day, Guillaume-Francois Rouelle. Largely self-taught, Rouelle had secured a position of ‘demonstrator’ at the Jardin des Plantes, the science and natural history institute in Paris. His lectures were infamous, regularly upstaging and contradicting lecturers, much to the amusement of the audience – who included the young Antoine Lavoisier and the encyclopaedist Denis Diderot. He delivered his lectures with unbridled enthusiasm, often tearing off his coat, his waistcoat, and his wig as he warmed to the subject. From Rouelle, Woulfe got a superb grounding in practical chemistry and came into contact with many of the leading young scientists of the time. He seems also to have developed a real love of mineralogy, travelling to Germany, Hungary and Bohemia, where he amassed a collection of remarkable specimens. He moved to London around 1750, where his Parisian contacts may have helped introduce him to the royalist John Stuart, Earl of Bute, a Scottish aristocrat with a strong interest in the sciences, and especially botany and mineralogy. Bute had met the Prince of Wales (the future George III) around the time of the Jacobite uprising of 1745, and became the future king’s tutor. Woulfe began working in Bute’s home laboratory. In 1767, the same year he was elected to the Royal Society, Woulfe submitted a letter in which he described a new way of handling noxious gases like ammonia, hydrogen chloride and chloroethane by bubbling them through a flask or bottle containing water before collecting the gas in another container. 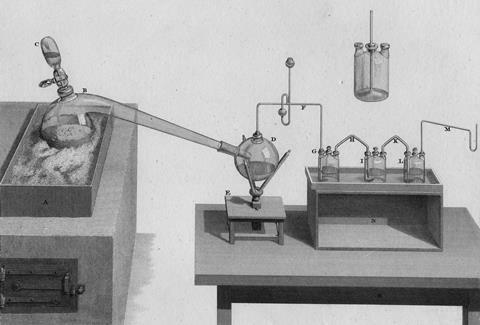 Johann Glauber, an early chemist, had previously described passing gasses through an intervening vessel to cool them. Woulfe’s method had key advantages. It hugely improved conditions in the laboratory. As he noted, bubbling the gas through water when making ‘nitrous air’ (nitric oxide) served to ‘prevent those noxious fumes, which have such an effect on the lungs of the operator, as frequently make him spit blood’. The technique also meant he could make exceptionally strong acids and alkalis. Woulfe later prepared the bright yellow dye picric acid (trinitrophenol) by nitration of indigo – although he missed its potential as an explosive. Although Woulfe used a flask with a side-arm in his original work, it would develop into a two or three-necked square shouldered vessel, sometimes called ‘Wolff’. Today, it has been replaced today by Heinrich Drechsel’s wash bottle (Chemistry World, June 2008, p71). Woulfe’s skills and connections made him a key supplier of minerals for the great English collectors like William Hunter and his friend Bute, although few individual minerals can be ascribed to him with certainty. He is known to have supplied chemical reagents to Joseph Banks on his voyage to the South Seas with Captain Cook, and also worked closely with Joseph Priestley, providing him with glassware and advising on gas handling technique. But Woulfe’s approach was old-fashioned and distinctly odd. Aside from attaching scribbled prayers to his apparatus, he seems to have been unaffected by Lavoisier’s ‘new system of chemistry’. Defending Johann Stahl’s phlogiston theory, Priestley would remember ‘Peter Woulfe, whose knowledge of chemistry will not [be] questioned, saying that there has been hardly anything deserving to be called a discovery subsequent to it.’ Woulfe probably believed in transmutation and his work on mosaic gold (tin chloride) may have been driven by alchemy. Indeed, when he was proposed for Fellowship of the Royal Society, its records his address as Old Bath Place in Clerkenwell. This was where the Swedish mystical philosopher/prophet Emanuel Swedenborg stayed when visiting London. Woulfe was a member of a Masonic lodge devoted to Swedenborgian occult rites, the ‘London Universal Society for the Promotion of the New Jerusalem Church’, which itself was an offshoot of the ‘Illuminés d’Avignon’. Both attracted a mix of radical preachers, artisans and scientists and operated on the edge of legality. Later, Woulfe would move into chambers in Barnard’s Inn (today Gresham College) where he became ever more eccentric. His rooms were ‘so filled with furnaces that it was difficult to reach his fireside’. He would entertain friends to breakfast at 4am, but only if they used a secret knock to gain admittance. One of them commented that he once ‘put down his hat, and never could find it again such was the confusion of boxes, packages and parcels that lay about the chamber’. Woulfe died after catching a cold, confident that he could cure it by taking a coach to Edinburgh and back. It was an odd end to a strange and messy life. And even though our labs are tidier today, ironically our neatness is driven by the same thing that worried Woulfe: laboratory safety. I am grateful to Peter Morris for his observations and corrections.